Akitoshi Kawazu, game designer and story planner for SaGa Scarlet Grace, took to the Tokyo Game Show stage to show off his new game. In the video below, we see a thirty-minute segment of the PlayStation Vita-exclusive RPG including the world map, party management, and combat. 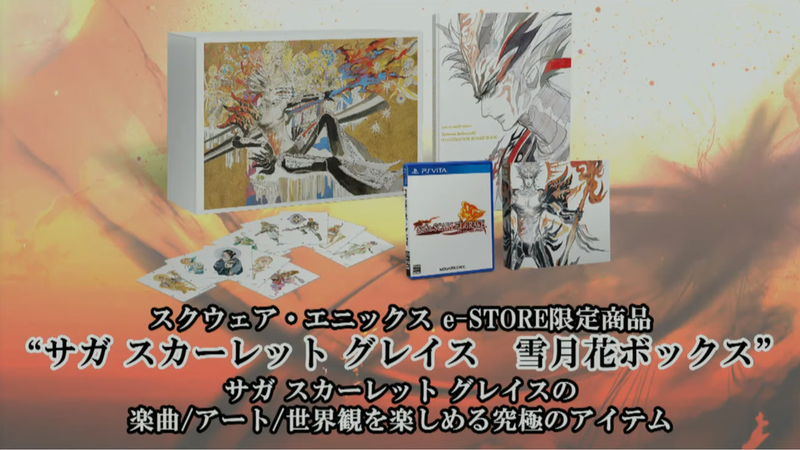 A special edition was also revealed that includes special packaging by series character artist Tomomi Kobayashi, an artbook, soundtrack, and special cards. SaGa Scarlet Grace releases on Decemeber 15th, 2016 in Japan. Posted in SaGa Scarlet Grace, Tokyo Game Show 2016. Man! really hope this special edition makes it west. Would grab it in a heartbeat.